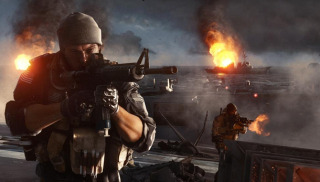 DICE have a released a video teasing the pre-alpha version of Battlefield 4's spectator mode. In it, DICE producer Daniel Matros runs through the features of the mode, while also battling some incredibly awkward displays of over-the-top enthusiasm. Quick tip guys: nobody has ever been that excited about the ability to toggle a user interface. Spectator mode is being designed with a degree of e-sports and streaming focus - but DICE also seem keen to support more directed, "cinematic" action. Unsurprising, given the series' history of producing excellent machinima, like the Moments film for Battlefield 3. To that end, you'll be able to place multiple static cameras throughout the map, letting the spectator set up and film action from specific angles. For regular streaming and match viewing, the mode will allow warfare voyeurs to switch between first and third person views, instantly flip between players through the scoreboard, and get a picture-in-picture tabletop overview of the full map. Of course, for those who'd rather play the game, the video also offers a chance to see the early alpha build in action.